Ridership fell 6 percent in a single year. The response from the Cuomo-led MTA and de Blasio-led NYC DOT hasn't been commensurate to the scale of the problem. NYC bus ridership fell 6 percent in 2017, a stunning year-over-year decline that accelerates a decade-long trend. It’s the largest annual percentage drop in bus ridership in 15 years, according to a new analysis by the Bus Turnaround Coalition. New Yorkers are abandoning the bus at historic rates because service is terrible and getting worse. Average citywide bus speeds dropped from 7.3 mph in 2016 to 7 mph in 2017, and the share of buses that arrive in bunches — a key measure of reliability — increased from 9.4 percent to 11.8 percent. The Coalition has released report cards for every MTA bus route, measuring bus speeds and reliability, and the overwhelming majority get D’s or F’s. Behind the grades are the daily experiences of hundreds of thousands of New Yorkers whose lives are disrupted by bad bus service. People are late to work, losing time with their families, and missing appointments because buses are so slow and unpredictable. The rapid drop in bus ridership should register as an emergency to officials at the state, the city, and the MTA, but the response from politicians and policy makers has been sluggish. The MTA is years behind peer cities like San Francisco and London on citywide all-door boarding, and under Mayor de Blasio, DOT isn’t implementing street improvements like bus lanes and transit priority at intersections as fast as the situation demands. The grades from the Bus Turnaround Coalition hold NYC bus service to what advocates call a “high but achievable” performance standard. In Manhattan, the borough where bus ridership has declined the most, only one route graded out as high as a C (the M60 Select Bus Service). 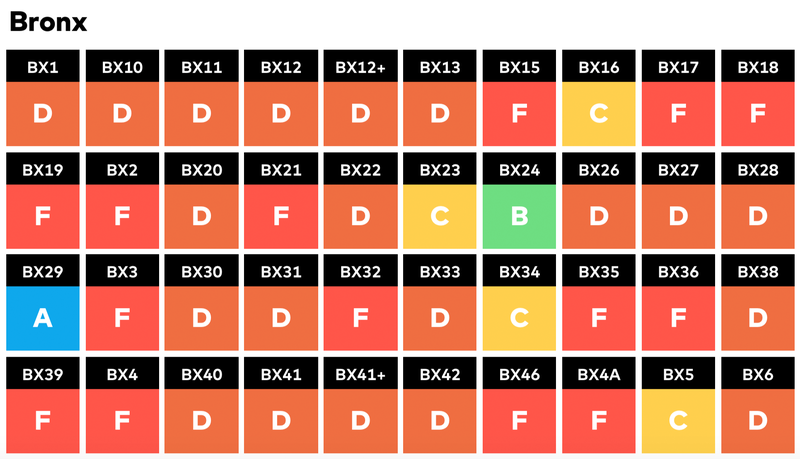 Only a handful of routes citywide qualified for A’s or B’s — typically routes with low ridership. It’s the high ridership workhorses of the bus network — the routes that the most people rely on — that typically score poorly. Any bus route averaging less than 5 mph received an “F” for bus speed. If more than 15 percent of buses arrive 25 percent sooner than the scheduled headway, the route received an F for bunching. It’s mostly D’s and F’s for bus routes in the Bronx — and everywhere else in NYC. “We see that our buses, unfortunately, are inefficient, and New Yorkers basically — they don’t want to use them,” Public Advocates Letitia James said at a press conference with advocates this morning. City Comptroller Scott Stringer, who released a report in November calling out the city and the MTA for failing to address the alarming collapse of bus service, said it’s past time for a “bus action plan” like the one the MTA has released for subway service. The formula to improve bus service is not a secret. Since 2016 the Bus Turnaround Coalition has pressed the MTA to modernize bus dispatching and implement citywide all-door boarding as part of its next fare technology upgrade, while calling on NYC DOT to accelerate the implementation of bus lanes and transit signal priority around the city. For the most part, the de Blasio administration only adds bus lanes to designated Select Bus Service routes, although NYC DOT has identified targeted street segments where bus lanes would help transit riders bypass traffic congestion. And DOT has only committed to add bus priority at traffic signals on five bus routes per year, even though the technology is already in place to rapidly scale up implementation. Today the Coalition called on the mayor to double the pace of transit signal priority implementation in 2018, and to create bus lanes with effective enforcement on at least 10 additional routes per year. MTA ridership numbers for 2016 are in, and it's clear that New Yorkers continue to abandon slow, unreliable bus service. If the MTA and NYC DOT don't act urgently to improve bus speeds and reliability, warn transit advocates, they risk "a downward spiral of increasing congestion, slower travel speeds, and a slower New York." Advocates and council members called on Mayor de Blasio to devote more resources to bus lanes and other improvements that can reverse the rapid decline in bus ridership. New Yorkers have been giving up on the bus, with a 16 percent drop in ridership between 2002 and 2015. An analysis of each borough by Eric Goldwyn shows the bus ridership decline has been concentrated in Manhattan and Brooklyn. There may be several factors at work, but worsening traffic congestion is almost certainly a culprit. Almost three-quarters of New York City bus lines, and almost all of the routes in Manhattan, have earned a D or F grade from a leading transit advocacy group. Through September, the NYPD issued three times the number of moving violations than 2017 — but bus speeds remain the same.